Two door online controller with POE, RTE, DPS. The 7000 online controller supports two doors and can be powered directly over cat5 cable eliminating the need for a power supply. The controller, reader, and door strikes can all be powered through POE. The 7000 supports barcode, magstripe, and proximity readers. The 7000 is an online controller. The controller does not make any access decisions, rather it passes the card data to a host system and the host system determines access granted or denied. The 7000 can also be used as a serial operated relay, controlling 2 onboard relays. 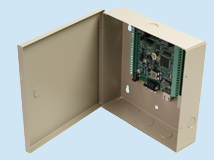 Dimensions Board 5" 5", Enclosure 8.25" x 8.25" x 2"